The former Beatle cancelled one show after falling ill with a virus last week but has now cancelled the whole tour. A statement on his website said "Doctors have ordered Paul complete rest and he has been doing all he can to get better. Paul has only ever had to reschedule a handful of shows in his entire career and is so upset about this situation, he hates to let people down." 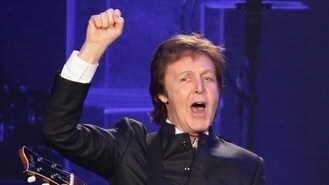 It said Macca had wanted to perform "against doctors orders" but was convinced not to. He said: "Thank you so much for your kind messages of support. I'm so very touched. Unfortunately my condition has not improved overnight. I was really hoping that I'd be feeling better today. I'm so disappointed and sorry to be letting my fans down." The 71-year-old is still scheduled to perform in Seoul, South Korea, on May 28 followed by 19 gigs in the United States. He recently teamed up with the team behind War Horse who created a robot for his latest video and the now-cancelled live shows. The giant puppet, called Newman, appears alongside the musician in the Night At The Museum-style promo for new single Appreciate. In the film, Newman is on patrol in a futuristic museum in which humans are on display and he sees Sir Paul in one of the cases. The pair go on to walk around the gallery and the other exhibits come to life.